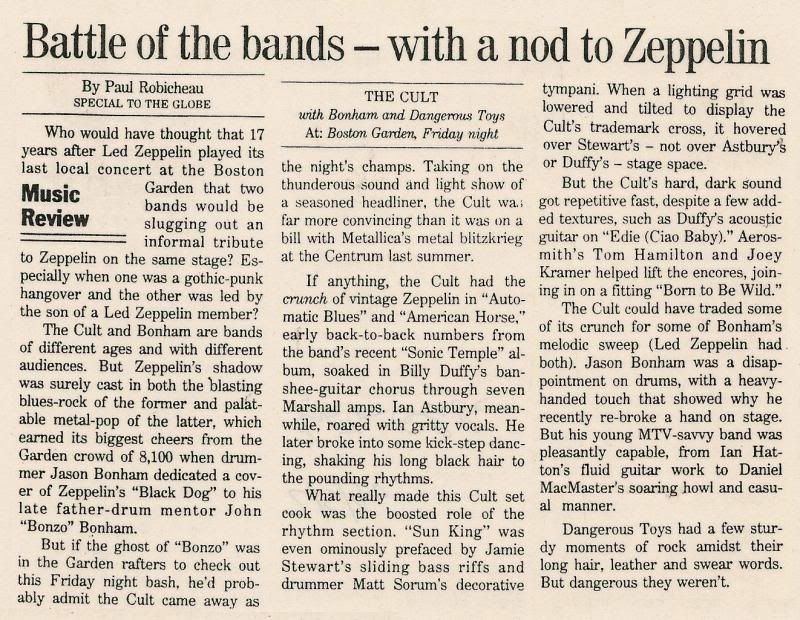 As Zeptember turns to Rocktober and the imminent launch of Jason Bonham's Led Zeppelin Experience Tour it seems appropriate to start a new thread for the purpose of presenting a vast array of periodicals, photographs, videoclips, anecdotes, gig reviews etc. 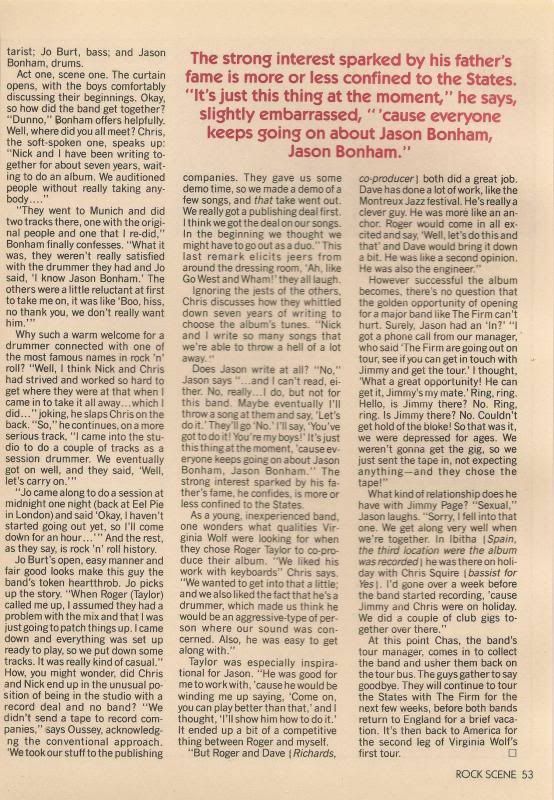 from Jason's three decades in rock music. 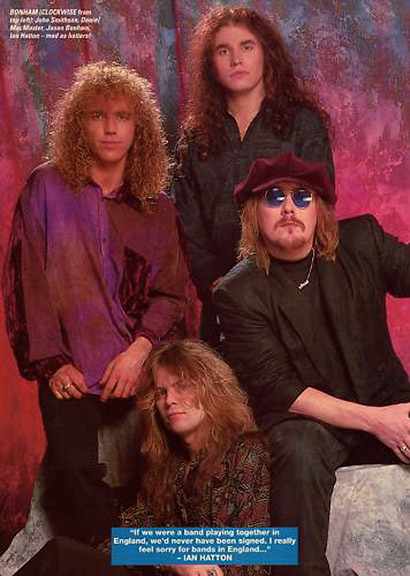 Airrace was the first group Jason Bonham joined, at age 17. 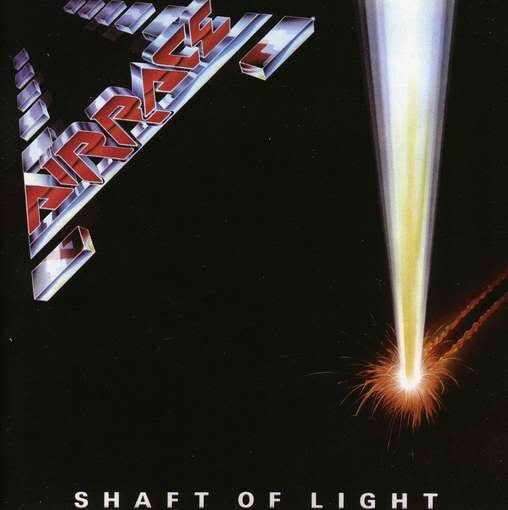 They released one hard-driving rock album in 1984, Shaft Of Light. 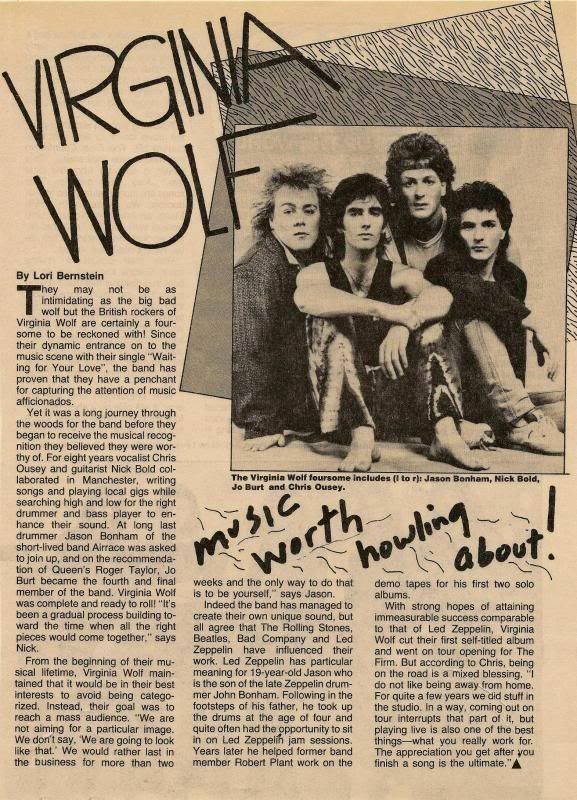 Official music video for 'Waiting For Your Love' by Virginia Wolf. Produced by Roger Taylor of Queen and David Richards. Roger also makes a few appearances in the video. 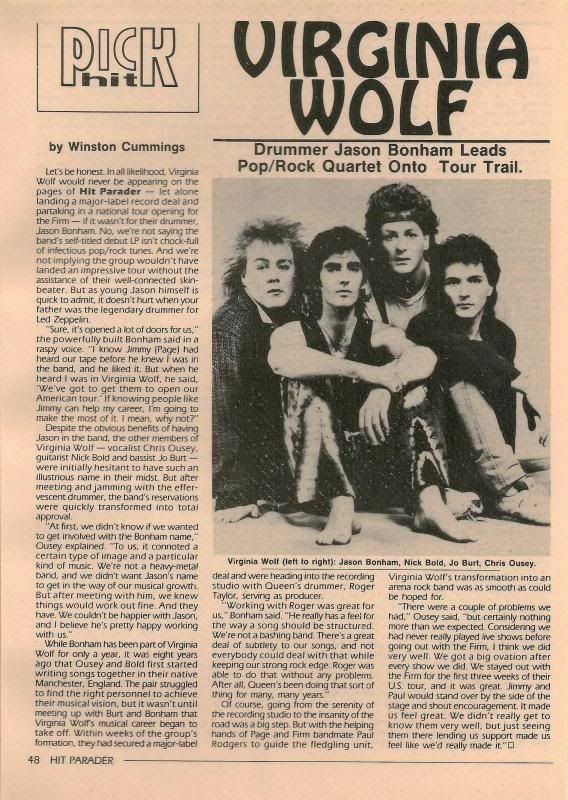 Written by Nick Bold. Also featuring Spike Edney on keyboards and Linda Taylor and Tessa Niles on backing vocals. 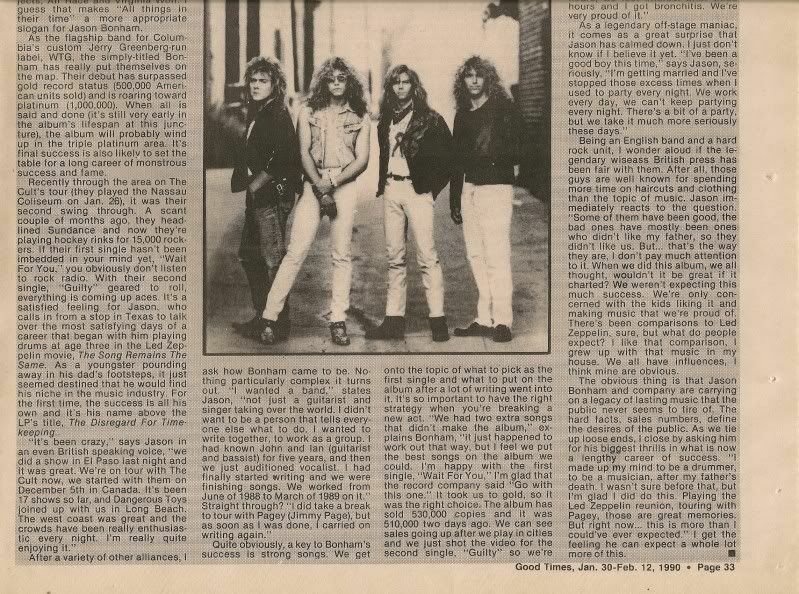 Released on their self titled debut album in 1986, also released as a single that same year. Both their albums were re-released in 2003 on CD. One of the most underrated bands of all time, how they didn't become immensely huge is a mystery. Take A Chance by Virginia Wolf. 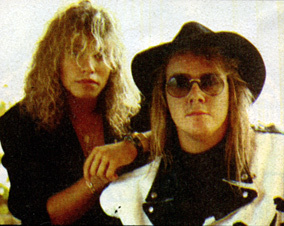 Produced by Roger Taylor of Queen and David Richards. 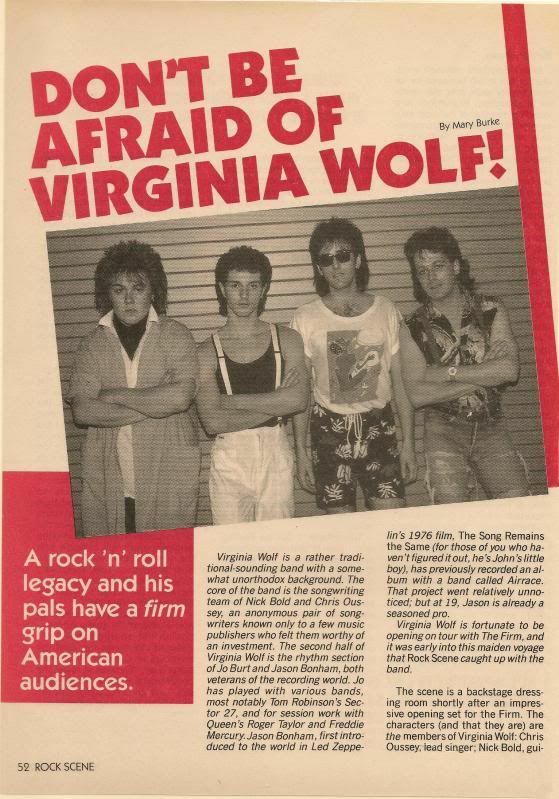 Released as the B-side on the 'Waiting For Your Love' 7" single in 1986, and on Virginia Wolf's self titled debut album that same year. Released on CD for the first time in 2003. Written by Nick Bold and Chris Ousey. Interesting video of Jason's rehearsal with JPJ, JP and RP (especially the last minute of it). JPJ's eyes at the end are something to see. Wow, thanks for posting that video Steve, very interesting. Jason has come a long way! Actually it's the rehearsals that are cited as better than the actual show - there was no soundcheck. I'm filled with sufficient self-doubt now so I'll see what I can come up with too. This is why I try never to post from memory. Ok, there was a soundcheck but it was held the day prior to the gig. 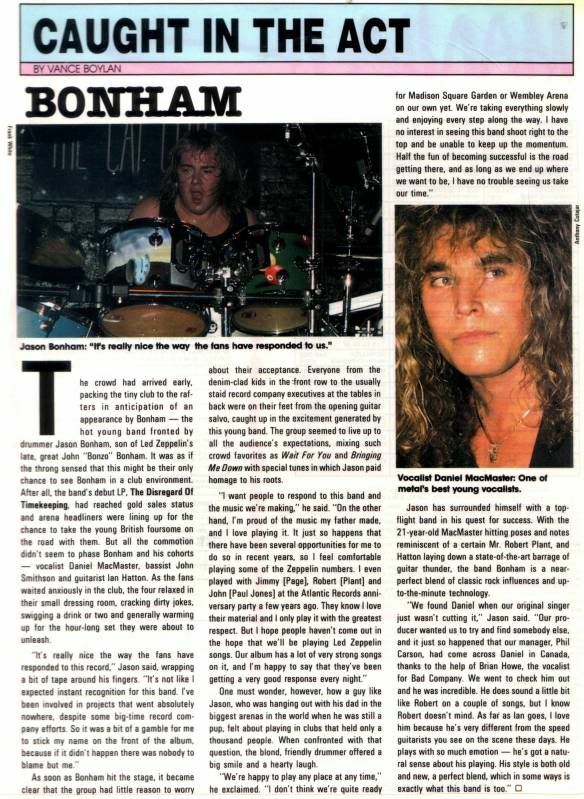 Earlier in the month Page, Jones, and Jason Bonham rehearsed fifteen to twenty numbers at Nomis Studio in London. Jimmy arrived in NYC on Wednesday, May 11th and was booked into a hotel which he left only twice, each time for rehearsals. Robert arrived later the same day. 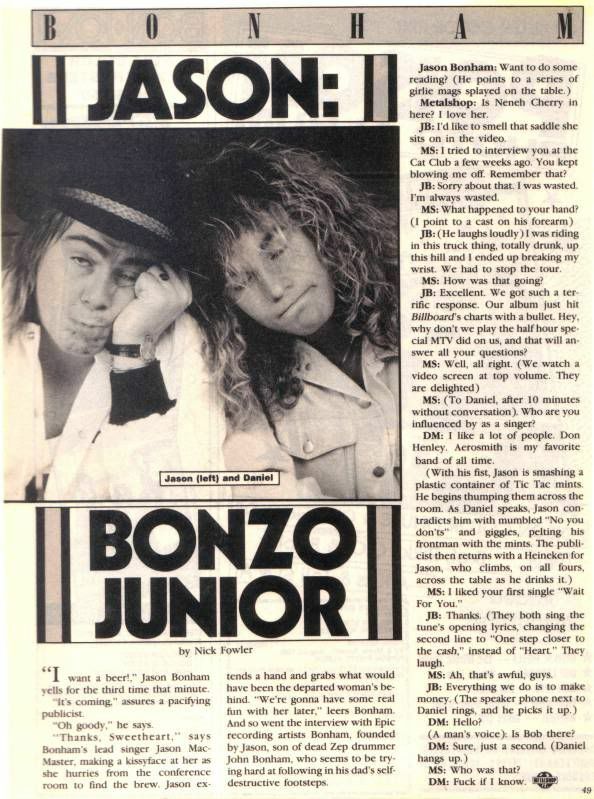 Jason's home video shows some of their first rehearsals on that date. Additional rehearsals were held the next day, Thursday, May 12th. They held a soundcheck and final rehearsals on Friday the 13th. The gig was Saturday, May 14th so the soundcheck was actually held the day prior to the show as opposed to the day of. The rehearsals are fantastic. I've had this on video for a number of years. Still have it on VHS. Much better than the show performance itself. The band weren't quite on, plus the sound and audio mix problems didn't help. I actually have this on VHS!! 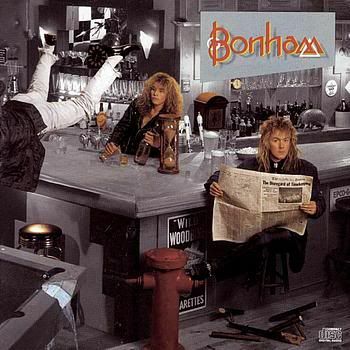 It shouldn't be surprising that the debut album by a band fronted by Jason Bonham, son of Led Zeppelin drummer John Bonham, would bear a resemblance to the music of Dad's band. But The Disregard of Timekeeping doesn't so much sound like a Led Zeppelin album as it does like one of the solo albums by former Zeppelin singer Robert Plant. That is to say, it is altogether more conventional and controlled -- more pop, in a word -- than Zeppelin, which could be quite adventurous at times. 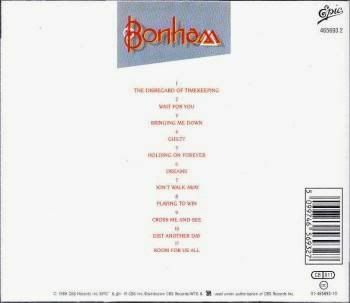 Here, Bonham-the-group sets up majestic guitar/keyboard riff patterns; Daniel MacMaster, in a familiar tenor screech, repeats simple chorus hooks; and Bonham-the-drummer pounds away in the familiar hard, woody sound of his father. The result is palatable, but without the famous name it would be hard to distinguish from the army of other Zep imitators. Author: David Silverman, Entertainment writer. The clock radio went off one morning and I woke up to Jason Bonham screaming in our ears. Locked in a studio with WLUP`s morning deity, Jonathon Brandmeier, Bohnam was pounding a snare and wailing at the top of his lungs- completely out of control. Two hours later he was slumped in a seat in The Tribune`s lobby, pondering the crushed ice at the bottom of a Styrofoam cup and looking exhausted, like he`d just been tossed from a moving train: mottled hair, rumpled shirt and dazed expression. 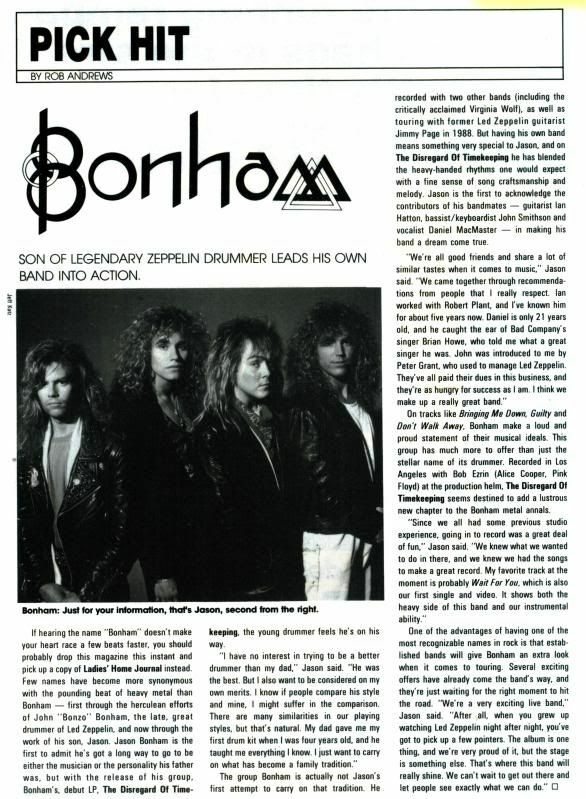 What Bonham did was to follow in his father`s footsteps. Bonham might carry the birthright, but he also carries the burden. When his father died in his sleep after a drinking binge in 1980, it came as no surprise to most. 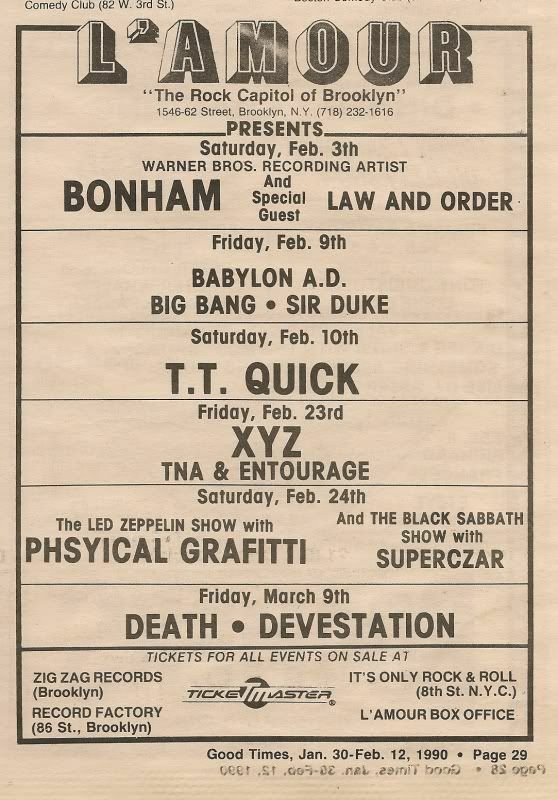 Hard rock and hard living had been synonymous with Led Zeppelin. Almost a decade later, the son is seeking to divorce the image from the music. 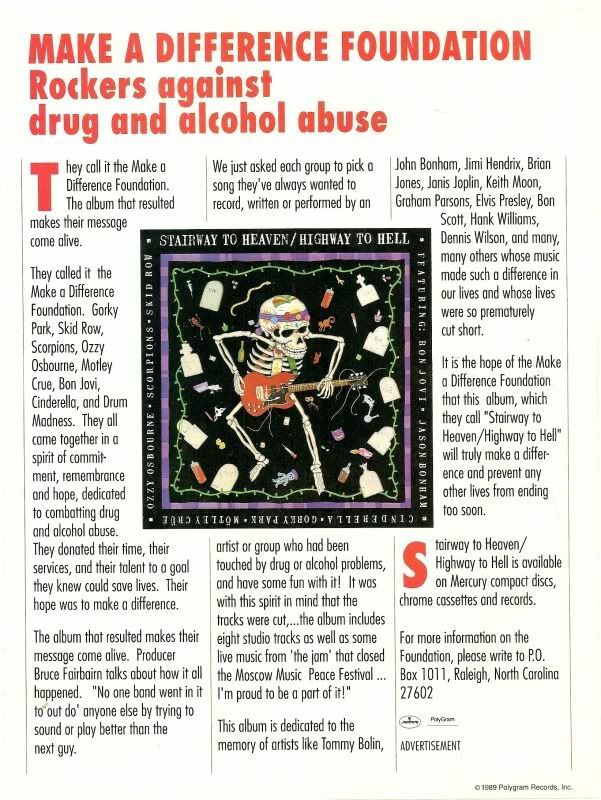 Through his involvement with David Lewis and the Make a Difference Foundation, sponsors of the Moscow festival, Bonham spends part of his time preaching substance responsibility. 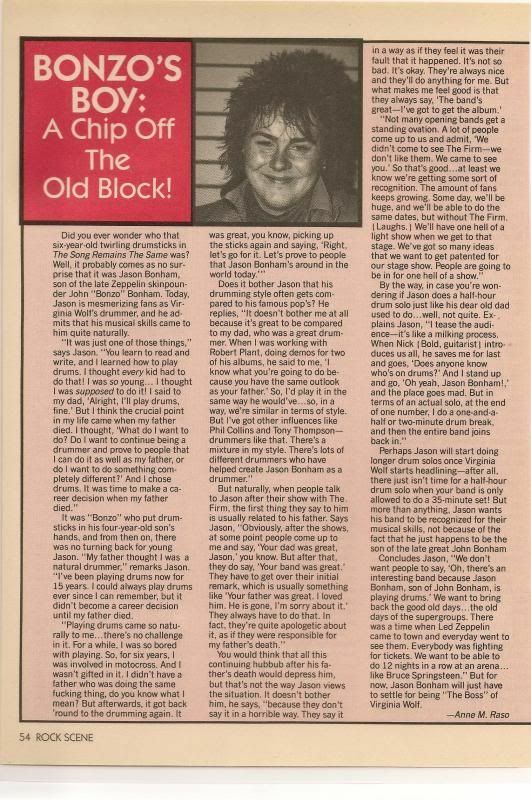 ``Alcohol killed my father,`` Bonham said. ``He went out and got drunk, came home and choked on his vomit in his sleep. There`s no escaping that and I`ve never tried to hide from it. 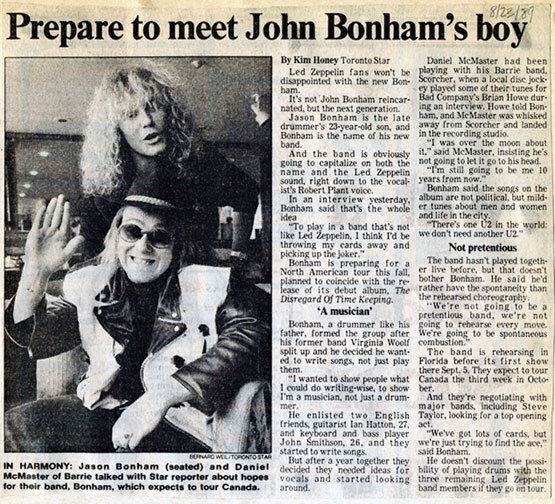 Bonham`s move toward music and away from his first love, motorcross racing (he was second in the British 15-and-unders for two years) came in 1987, at Atlantic Records` 40th anniversary party. Bonham, joining Zeppelin guitarist Jimmy Page and singer Robert Plant, performed together for the first time since the band was dissolved. 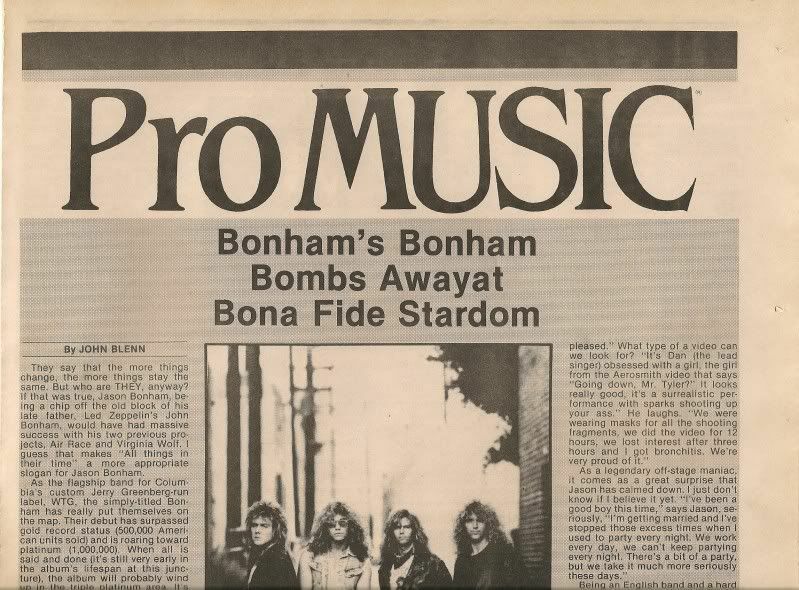 Bonham was recording with Page at the time, laying tracks for the ``Outrider`` album, and the Atlantic brass was impressed enough to offer him his own deal. 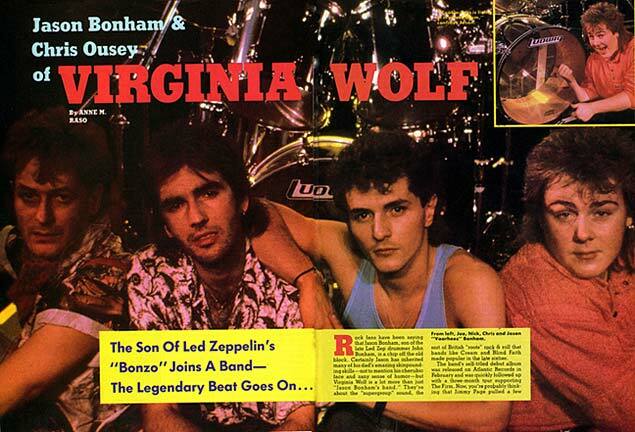 After the Atlantic reunion, Bonham kept a hectic schedule, working with Page during the week then heading to rehearse with the newly recruited members of Bonham-guitarist Ian Hatton, bassist Jim Smithson and vocalist Danny McMaster. 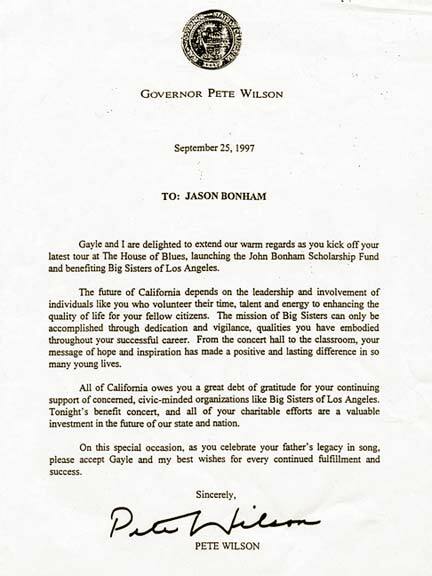 After appearing on tour with Page, Bonham the band became the sole focus and the future. 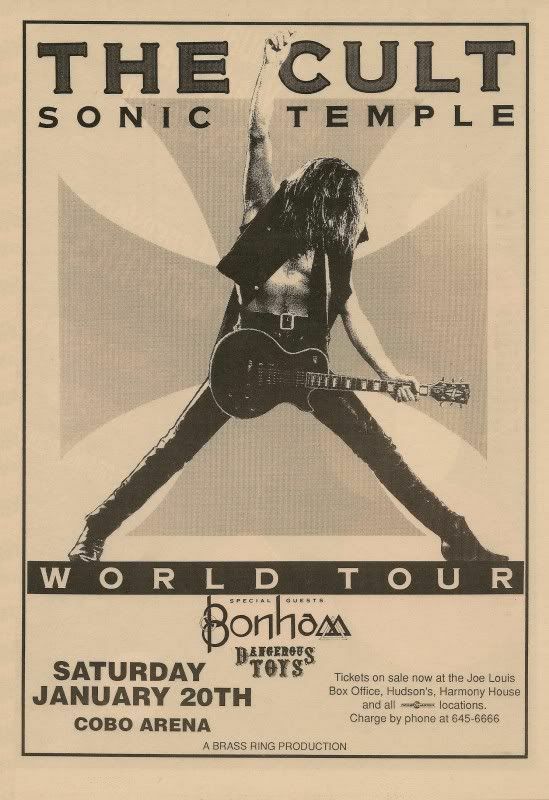 Bonham opens Friday for the Cult at the Aragon Ballroom. 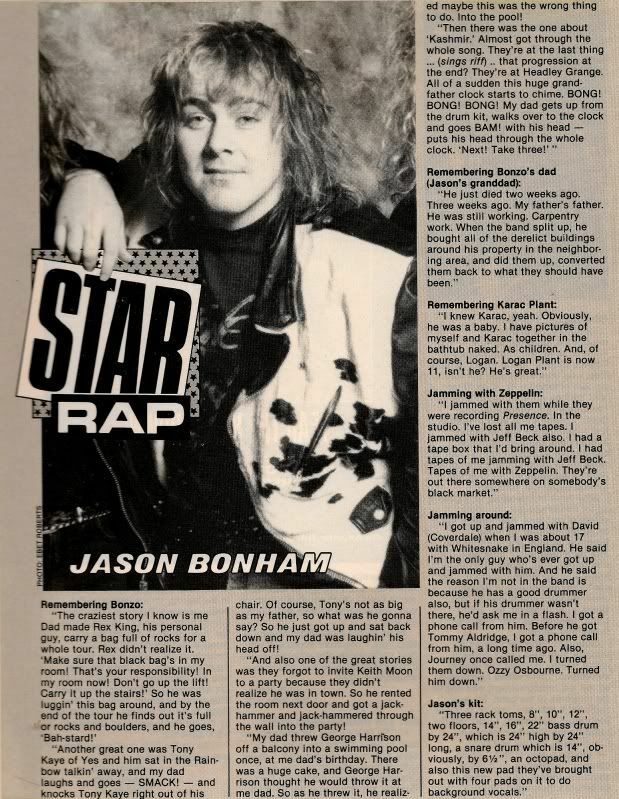 Jason Bonham, leader of the band Bonham, acknowledges some of his music tends to sound a lot like his dad's old band - Led Zeppelin. But that's only natural, he figures. He has remained close to Zeppelin guitarist Jimmy Page and singer Robert Plant since the 1980 death of his father, drummer John Bonham. 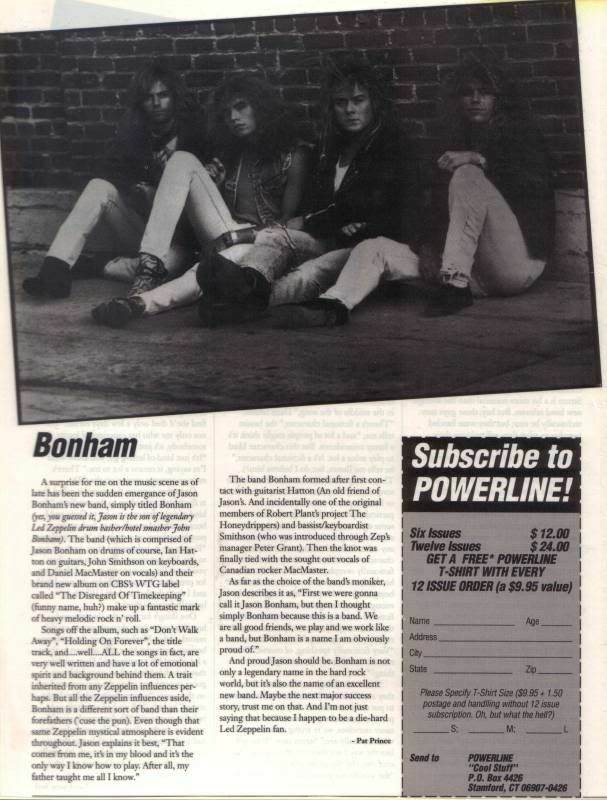 "They're like family," Bonham told the Dallas Morning News. "They're two of the greatest guys in the world, and I love them very much." 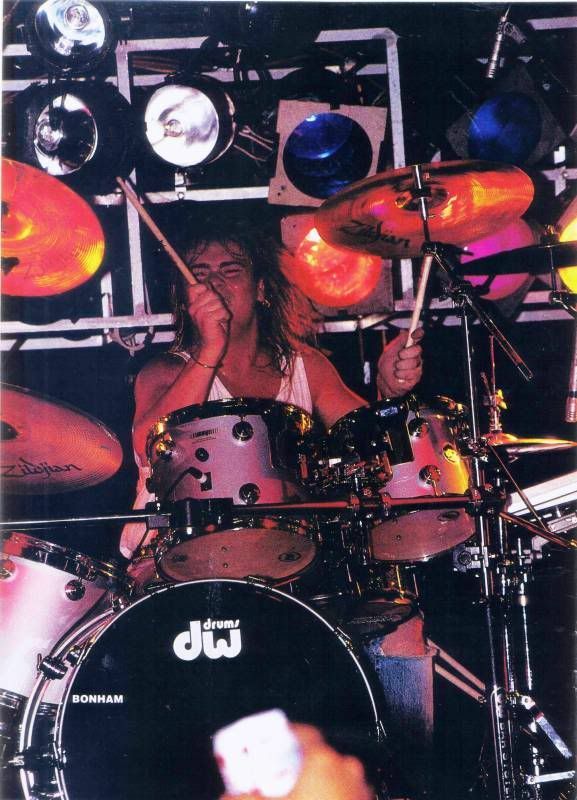 Bonham stood in for his father in a Zeppelin reunion performance in 1988. "It was very frightening but very heartwarming for me to play with Led Zeppelin," he said.